We can't preserve and share local history without your help! 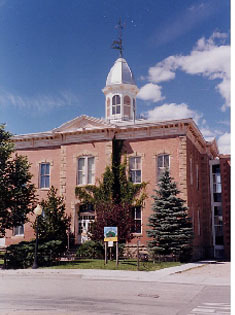 Buena Vista Heritage has been awarded a grant of $145,055 from the Colorado State Historic Fund to begin work on renovating the first Chaffee County courthouse (currently the Buena Vista Heritage Museum). . We invite you to donate to the $50,000 matching funds we need in order to actually receive this money. The first grant will put on a new roof, repair the soffats and gutters and restore the railing around the cupola. At the completion of this grant, Buena Vista Heritage will be eligible for more grants to continue renovation. If you would like to make a donation to our organization for the courthouse renovation, collection development, operating support, an endowment or a property under restoration, simply mail your check to P.O. Box 1414, Buena Vista, CO 81211. We can also accept your donation by credit card online below. If your donation is in honor or memory of someone, please indicate that so we may acknowledge the gift appropriately. Help with matching funds for the courthouse renovation. Help us maintain our operations, including the BV Heritage Museum. Ensure the longevity of BV Heritage. We're raising money for expanding the exhibits in the freight room. If you have items to donate to our collection -- illustrating local history, including agriculture, mining, domestic life or railroads, Buena Vista Heritage would be pleased to receive them. Please contact us at your convenience. There are many ways to support Buena Vista Heritage. One of the simplest is a bequest. It is also the most enduring way to leave a legacy for yourself or a loved one. I give, devise and bequeath to Buena Vista Heritage, a nonprofit corporation located in Chaffee County, Colorado, the sum of $__________. If you prefer to state a specific purpose for which your bequest is to be used, please keep in mind that our programs and projects change over time. However, it is our desire that you feel confident your funds be used to benefit the areas you care about the most. We would be honored to help you craft a bequest that will achieve your objectives. While not necessary, sharing your plans with us during your lifetime gives you a fuller opportunity to decide how your gift can best be used and could encourage others to make similar gifts. We also would like the opportunity to recognize you for your generosity. If you would like to discuss including Buena Vista Heritage in your estate plans, please contact Lisa Wagoner at 719-395-8458 or buenavistaheritage@msn.com. Gifts of stock (or other appreciated property) entitle you to a tax deduction for the market value of the donated stock. If the stock you wish to donate has been held for more than one year, you can avoid capital gains tax on any appreciation of the stock by donating the stock prior to the sale. Buena Vista Heritage benefits by selling the stock without paying taxes on the gain, and you benefit from making a contribution that would be larger than what you might have been able to donate in cash. A charitable gift annuity (CGA) is a life-income gift: a charity (like BVH), in return for a transfer of cash, marketable securities or other assets, agrees to pay a fixed amount of money to the donor (like you), for their lifetime. Both Buena Vista Heritage and you can benefit from life income gifts.